I am producing both functional and sculptural work. Both are closely related, employing many of the same techniques and firing effects. One is grounded in the utilitarian while the other allows me to explore new possibilities, unbounded by the parameters of a strong handle or fine drinking edge. I am attracted to ceramics by the breadth of expressive possibilities offered within the context of the material and firing process. There is a lifetime of experimentation and exploration to be done. My goal is to scrape at the surface, applying my talents and enthusiasm to the art making process. I select my material with a specific project in mind. 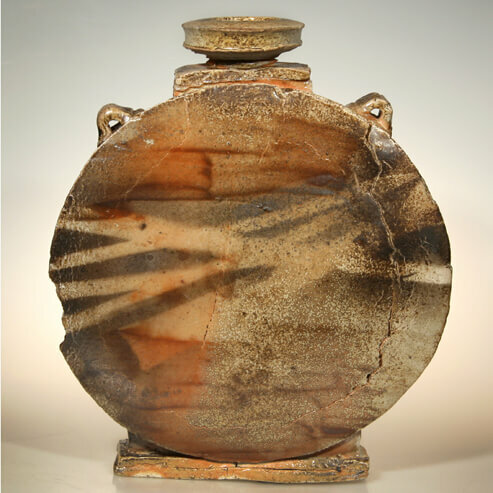 I consider the form, the firing atmosphere, glazes, and the availability of locally sourced materials. For domestic ware I make a white body, formulated for delicate, finer shapes. I want to create visually attractive and functionally sound pieces for use in the home. For large-scale work, requiring larger quantities of clay, I am employing local stoneware. The digging, crushing, mixing, and wedging of half a ton of clay is quite a physical process but insures I have complete control over my medium. I enjoy the start-to-finish process of digging the clay out, forming it, and firing it. Certain themes carry through my work. The human figure provides endless inspiration and variation. The rhythms, postures, and proportion are a building block for a lot of my work. The human form provides a starting point, as does my background in photography, printmaking, and drawing. Today, the clay, surface decoration, and kilns are the tools I use. I test myself to employ my materials and techniques in new ways. It is important for my personal and artistic growth to consistently challenge myself. Ultimately, I want the viewer to appreciate my work not just as well-made pottery but also for its keen sense of color, balance, and texture.